Frank died of wounds received in action on 8th August 1915 at Gallipoli, aged 19. Frank Gilderoy Batters was born on 9th February 1896 in Heswall, Cheshire and baptised on 5th April in Meliden, the son of Frank Harry Batters and Isabella Eleanor (Gilderoy). 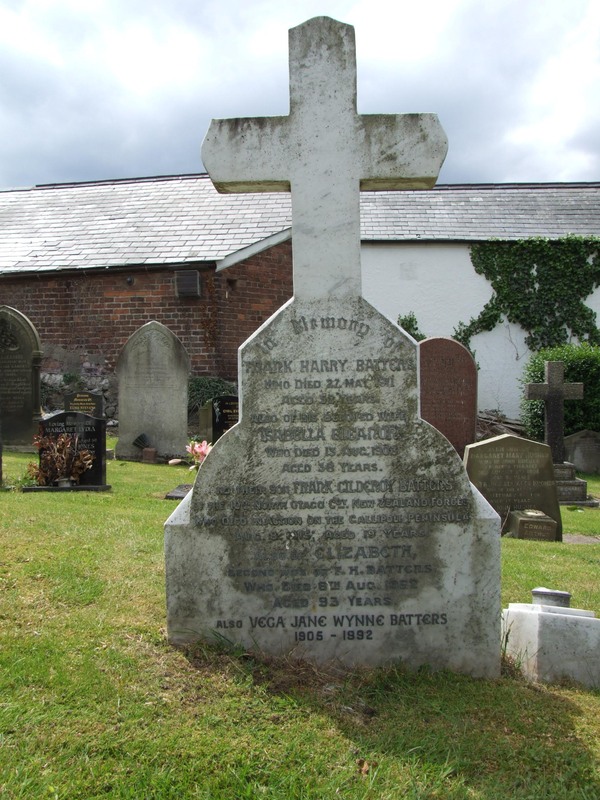 Frank and Isabella were married in Prestatyn on 23rd April 1889, he was the son of George Batters, Gentleman, and she was the daughter of William Henry Gilderoy, Gentleman. Frank and Isabella had three sons, George William, Frank Gilderoy and Philip Harry Bychton. In 1891 Frank and Isabella were living with their oldest son George William in New Ferry, Cheshire. Frank was a Colliery Agent. Sadly Isabella died and was buried on 15th August 1903 aged 38 years. On 21st September 1904 Frank married his second wife, Elizabeth Evans daughter of Evan Evans a farmer. They had two children, Vegar, a daughter, born in 1905 and Charles born in 1908. The 1911 census tells us that they were living in Cavendish House, Prestatyn. Frank H. Batters, 53, Colliery Agent, Elizabeth Batters 41, George 20, Frank 15, Philip 9, Vegar 5 and Charles 2. A visitor Jane Evans was staying with them and they had one servant. However, it would appear that Frank the father added his son Frank, even though he also appeared on the census for Ruthin Grammar School as a boarder. Shortly after this census was taken Frank Harry Batters died and was buried on 31st May 1911. From the Probate Calendars (Index) Frank left £2,207 (a considerable amount at the time), administration to George William Batters, his eldest son. On 5th September 1911 Frank Gilderoy Batters was enrolled as a cadet and joined the training ship “Mersey” of the White Star Line . We are told that Frank was 5’6″ tall, attended both Oswestry Grammar School and Ruthin Grammar School, and was not proficient in Euclid and Algebra! His next of kin is listed as his older brother, G.W. Batters, Cavendish House, Prestatyn. On 18th July 1913 Frank emigrated to New Zealand, on the “Ionic”. On the Passenger List he is listed as a Mariner aged 18, bound for Wellington. It is known that his brother George also emigrated, but can’t be found on Passenger Lists. Frank and his brother George both enlisted in New Zealand. Frank enlisted at Christchurch to the Otago Infantry. He was 5’8″ tall, weighed 154lb, had grey eyes and brown hair and was of dark complexion. His occupation in New Zealand was Labourer. A medical examination declared him in good health with no defects. He had tattoos on both forearms. He was single and his address was noted as Bell’s Boardinghouse, Moorhouse Avenue, Christchurch. He named his brother P.H.B. Batters, Tan Llan, Mostyn, North Wales as his next of kin. On 16th October he embarked from Port Chalmers, Dunedin, Otago, New Zealand bound for Suez, Egypt on either the Ruapehu or Hawkes Bay. Whilst in Egypt, on 13th March 1915 he was confined to barracks for 3 days for having a dirty rifle and bayonet. After spending some time in Egypt he was posted to the Dardanelles. On 9th May 1915 Frank was admitted to H.S. Gloucester in the Dardanelles with bullet wounds to his left shoulder and knee. On 17th May he was admitted to hospital in Cairo and on 3rd June he was admitted to Convalescent Department at Helman. He was discharged to duty on 11th June and rejoined his unit in the Dardanelles on 14th July. On Sunday 8th August 1915 a report was received from the 4th Field Ambulance that Frank had died of wounds received in action at Gallipoli. He was 19 years old. The CWGC reports that his Battalion was involved in the Battle of Sari Bair fought from 6-10th August 1915, of which Chunuk Bair was one of the main objectives. 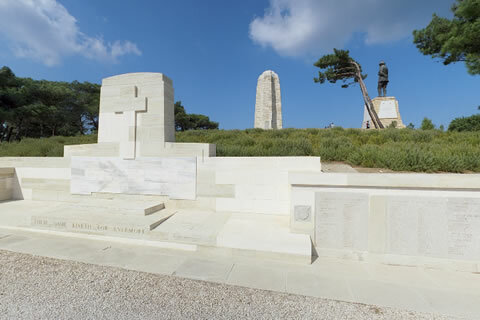 The Chunuk Bair (New Zealand) Memorial (on which he is remembered) is one of four memorials erected to commemorate New Zealand soldiers who died on the Gallipoli peninsula. Frank was buried in the Chunuk Bair Cemetery. Frank was awarded the 1914-1915 Star and the Victory and British War Medals. A letter to the War Expenses Department at Wellington reported that the Public Trustee had completed his administration of Frank’s Estate, and any medals should be forward to the Public Trustee, London on behalf of P.H.B. Batters who was a minor. From the Probate Calendars we know that Frank left an Estate worth £521. Frank’s brother George William Batters died as a result of this War too. George’s story is told here. After the War, George and Frank’s younger brother, Philip Harry Bychtyn Batters joined the RAF. First in the ‘Boy Service’ from 1st April 1919 and then the ‘Man Service’ from 18th January 1920 to 22nd July 1926, when he was discharged.